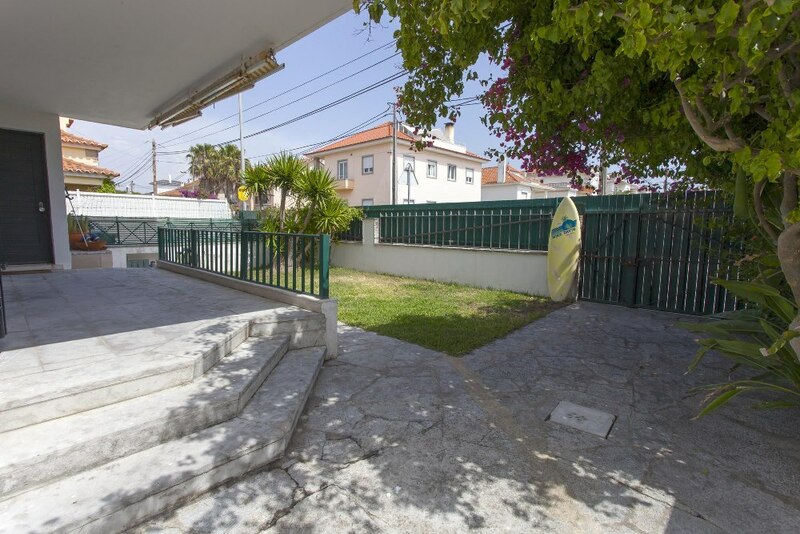 Surf camp located in Costa da Caparica just 2 minutes walking from the beach. The closest surf destination to Lisbon and one of the most popular in Portugal. Costa da Caparica is also one of the most popular beach breaks in Portugal and where many surf schools are located. Ideal for beginners, it is also fun for pros and advanced surfers with some ripable waves. 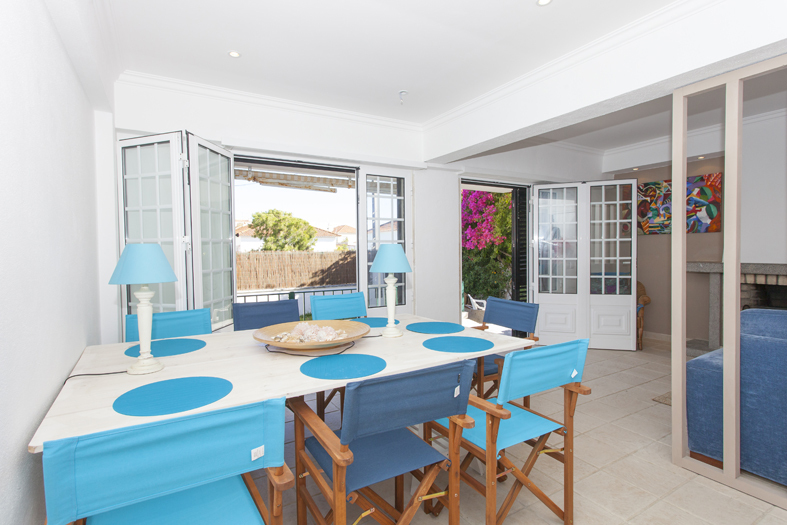 The surf house is super confortable and clean, offering rooms with up to 4 guests per room. 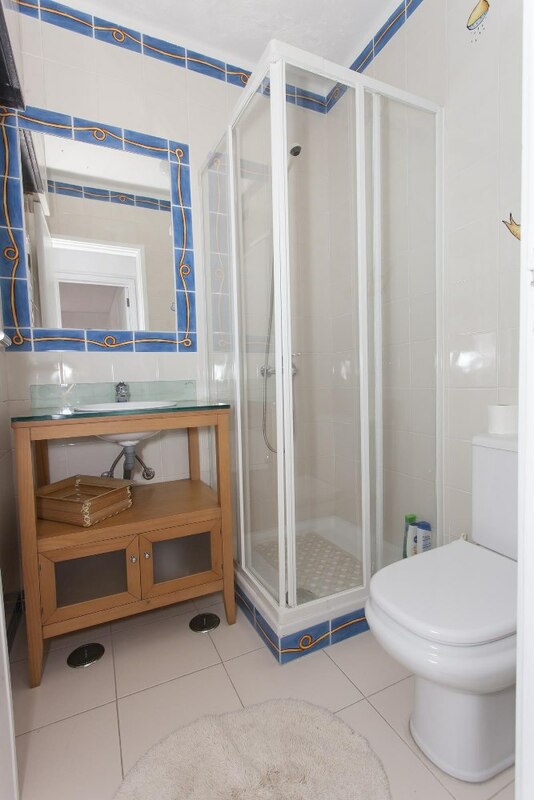 All rooms with private bathroom? 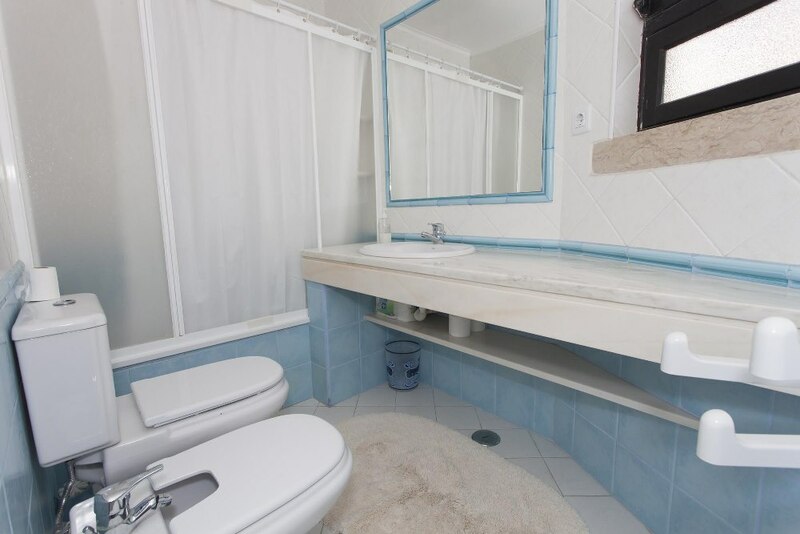 1double has private bathroom. 2 doubles share a bathroom. Costa da Caparica is the closest surf destination to Lisbon making it one of the most popular surf destination in Portugal. It can be mellow and relaxed which is perfect for surf lessons and beginners, but it can also be also one hell of a wave featuring surf contests and you'll often find Costa da Caparica in the cover of many surf magazines during the winter time. If you're living in the Lisbon area or travelling around, then Costa da Caparica is one of the top choices for you. This is the ideal surf camp for you and where you’ll learn the basics in a safe environment without any sort of "localism". 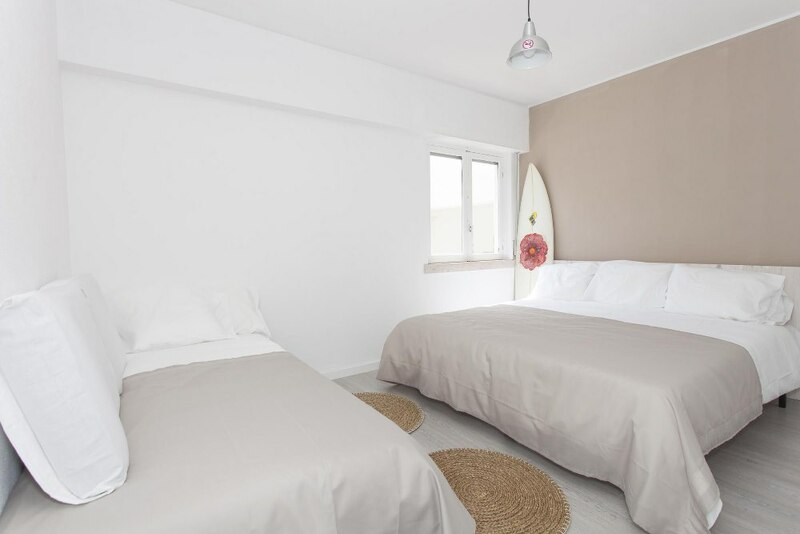 Whether traveling alone or in a group, our rooms will be able to cater for your surf holidays in Costa da Caparica helping you to have the very first surfing experience or purely improving your surf skills. Caparica Surf Camp is both a surf camp and a surf school, organizing surf lessons, summer camps for children, group events and surfaris for those who want to combine B&B with guidance through the best waves around and promoting surf like no other. 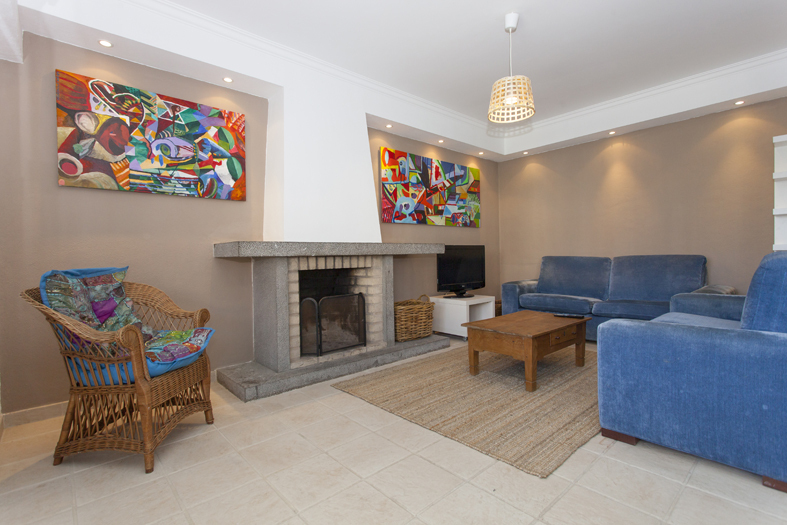 We take care of lodging, transport, food and any other needs you might have in mind, just to make sure you get the most out of the City and the Surfing! Our Surf Camp is located in Costa da Caparica 2 minutes from the beach. Check out the flight deals from Low cost airlines flying to Lisbon daily from several countries and discover one of the most exciting surfing areas in Europe, just a couple of hours away. 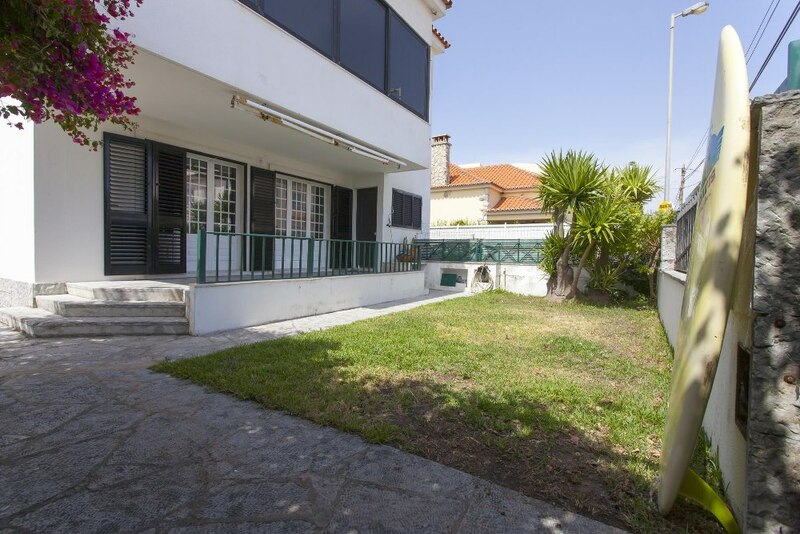 The Surf Camp is located in Costa da Caparica, about 300 meters from the Atlantic Ocean. Being this close to the beach is perfect if you're traveling for surf holidays. It means that you're the first to enter and first to leave the water and just think about all the traffic jams you'll save yourself from. 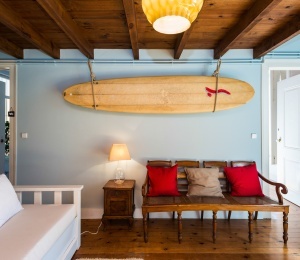 Avoiding daily morning and afternoon traffic to Lisbon is definitely worth considering if you want to be enjoying your time and have some stress free surf holidays in Portugal. Everything you need will be at walking distance from the surf camp, supermarkets and groceries, surf shops, restaurants and bars. 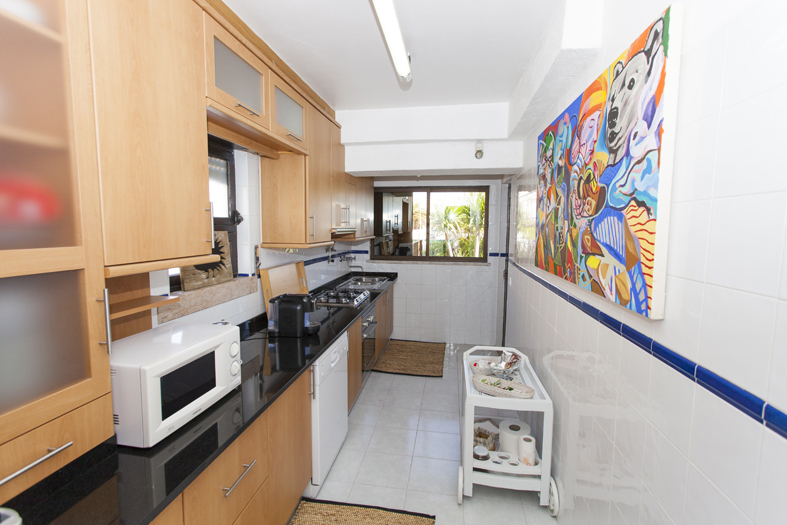 The surf house is super clean and well kept, you’ll find here the perfect spot the rest and hangout with your family and friends. 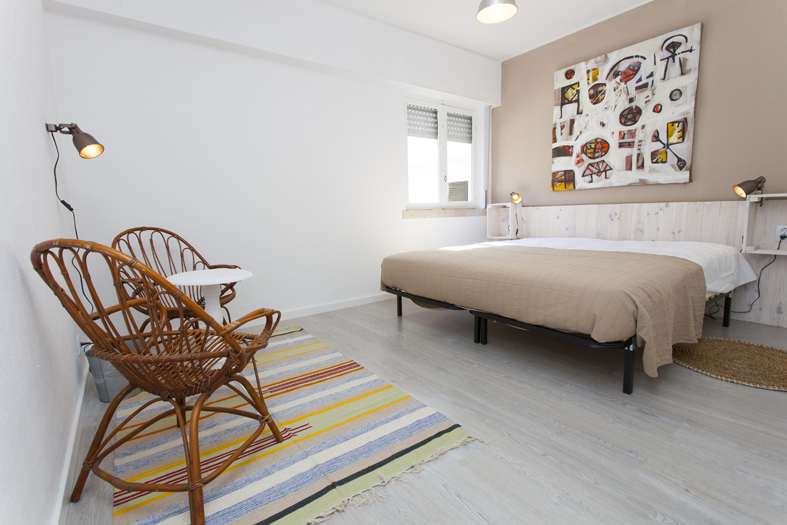 Each room can accommodate up to 4 adults, with very affordable prices. 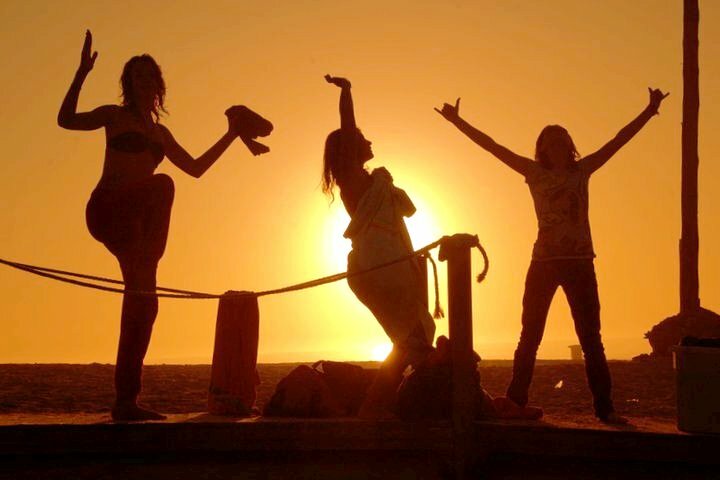 At the Surf Camp there's also a terrace where you can spend time with your friends after a hard day of surfing. If you're taking the surf lessons package then you'll have the chance to surf for 2 hours with the support and training of a certified surf coach, including all the stuff you need, namely a surf board adjusted to your level and a wetsuit. 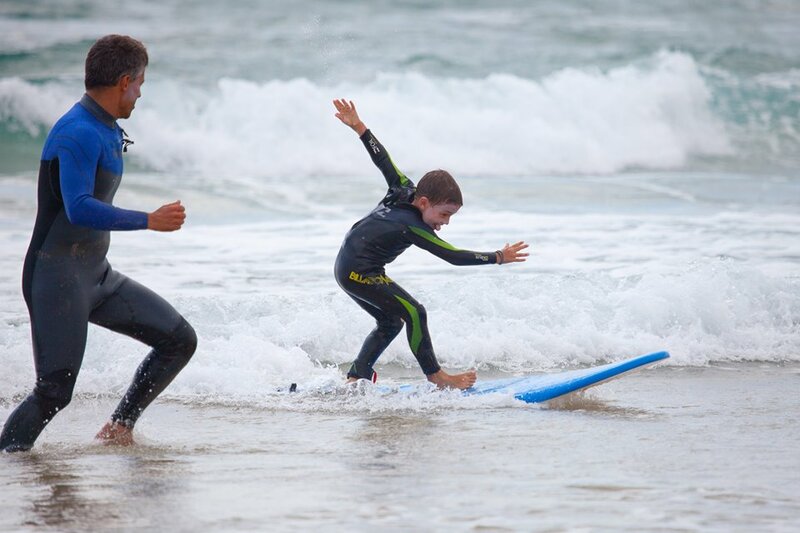 Our surf school has taught 4 year old kids along with their grandfathers, so it is totally safe for you too. If the surfing happens to be less good in Caparica, then you'll have the opportunity to go surfing where the best waves are whether it is Ericeira, Peniche or other less popular spots. We’ll go to the right places for your level of surf, so that you can enjoy 2 to 4 hours of surf (as much as the sea allows it) with all the support from our coaches. 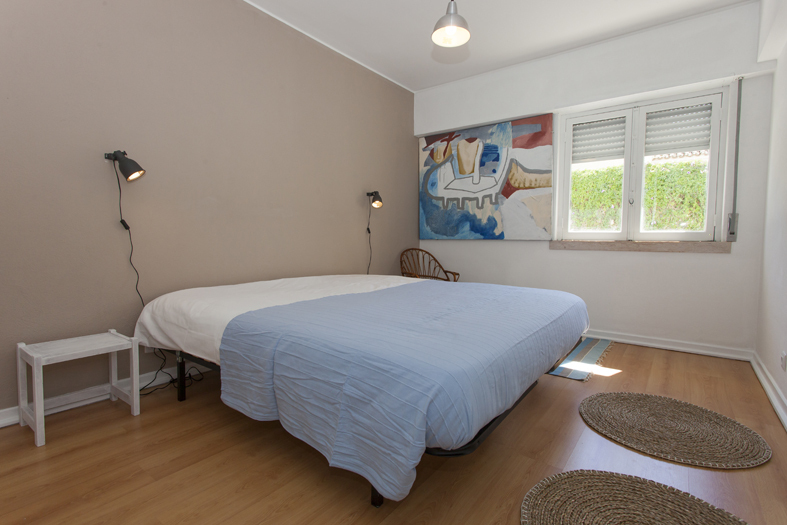 Lisbon and all other attractions are easily reachable by car or public transportation. Caparica Surf Camp can also arrange tours and a bunch of other extra surf activities you might think of! Costa da Caparica is a small little town but do not get fooled by the size of the city because this is probably one of the longest stretches of beach that Portugal has to offer with plenty of surf spots around. There are several types of breaks to suit all tastes, but mostly beach breaks and point breaks created by the jetties and seawalls. 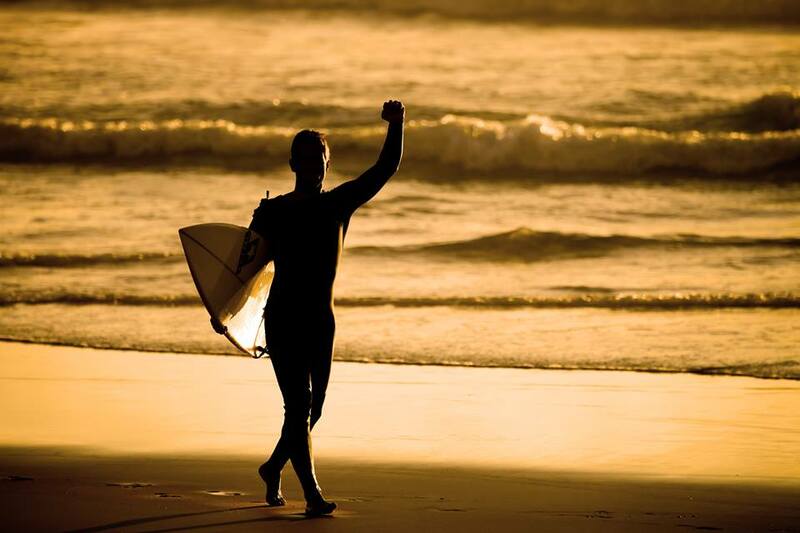 Our certified instructors are local surfers who know where to surf in Costa da Caparica. There are many surf spots that work with completely different conditions of wind and swell, so there's always a break with waves to be surfed within 15 or 20 minutes distance. Costa da Caparica has around 20 kms of beaches so finding a surf spot is not difficult at all! The northern part of Costa da Caparica has many jetties that result in a variety of point breaks type waves and also add stability to the sand bars such as Cova do Vapor and Praia do CDS. Down south you'll have for example Praia da Mata one of the many open beaches the offer fun, uncrowded surf for all sort of skills from beginner level to pro level. SURFINN © 24-04-2019 02:35:51. ALL RIGHTS RESERVED.